As the Kent County Sheriff celebrated his retirement with the ICE contract still in effect, Movimiento Cosecha GR members stood outside of Noto's Old World Italian Dining to call out "Shame, shame, shame," to the Sheriff and other attendees for their complicity in separating local families. Last Friday, during a chilly October evening, 12 to 15 members of Movimiento Cosecha GR and GR Rapid Response to ICE gathered outside of Noto's Old World Italian Dining in Cascade on the public sidewalk. 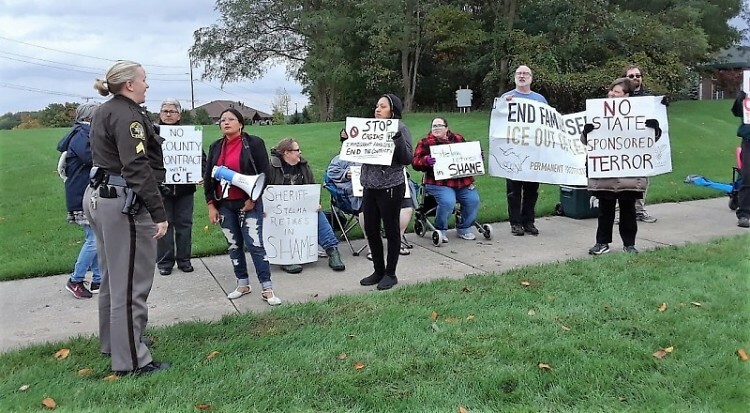 They held signs that said "Stelma retires in shame" and "Stelma is complicit with ICE," and unfurled a banner that read "End Family Separation, ICE Out of Kent County." The group spoke to a reporter and to their livestream watchers about the Sheriff's retirement party inside the restaurant. "The Sheriff will retire with his children and grandchildren while immigrant parents are being stolen from their children by ICE in Kent County," said Karen Meyers. 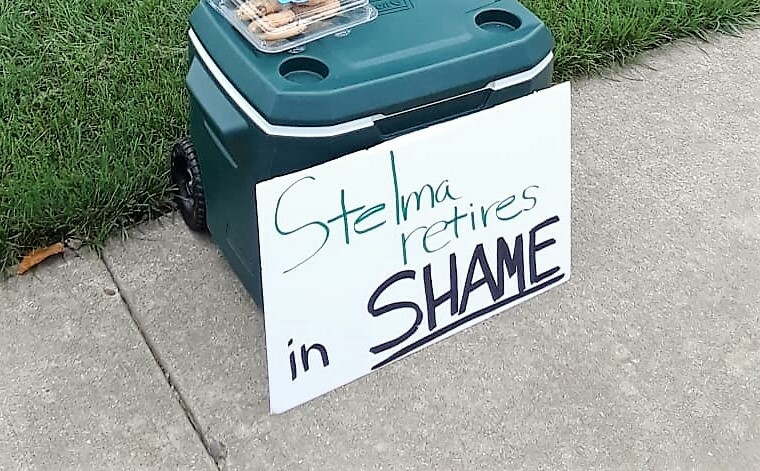 "Sheriff Stelma’s legacy has the stain of complicity with ICE violence. He is celebrating himself while the rest of the community is braced for the next time a family is destroyed," said Sarah Doherty. "We invite the new Sheriff, Michelle LaJoye-Young, to repair the harm that the current Sheriff has done by ending the contract with ICE as soon as she takes over the office. The retirement of Sheriff Stelma is a chance for a clean slate for the Sheriff’s department." "This contract causes a lot of trauma and fear to the immigrant community. And it doesn't have to be like that. The Sheriff's Office doesn't have to have this contract - it can be ended at any time," said Gema Lowe. "We can effect change nationally ... it starts in the local community." When asked about her message for the new Sheriff, Lowe replied, "Our message to the new Sheriff is the same as to the old Sheriff - end the contract. You don't have to uphold the contract. This is a new administration and a new day, so do good. Do good by the community. Do good." Idalia Tinoco, speaking in Spanish, said, "When immigrants who can't get a license, when they get pulled over, Kent County will report them to ICE and they can get deported, even though they were just here pursuing the American dream. It's very hard on people, on families." 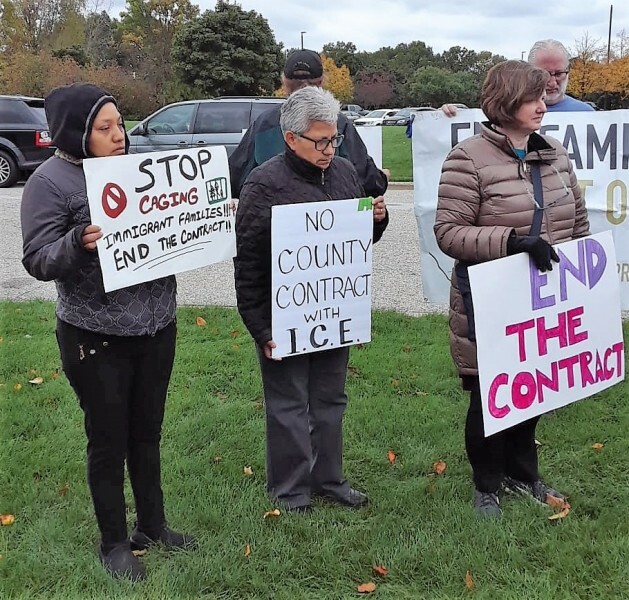 Kent County community members have asked for an end to the county's contract with ICE for over three months now, yet the Sheriff's Office has not yet done so, despite examples of law enforcement departments across Michigan and across the country ending their contracts. Lawyers from the Michigan Immigrant Rights Center and the ACLU have researched the matter and have stated clearly that Kent County can end their contract with ICE and refuse to hold immigrants for the 72 hours requested by ICE. Sheriff that doesn't like us! Ya, ya, ya, here we come, here we come! Kent County deputies watched the group and told them they were not allowed to go on Noto's property, but could stay on public property. The group continued to sing, chant and wave signs as attendees walked into the retirement party, causing some of them to stare. As Amy Carpenter commented, "The new Sheriff needs to end the contract right away when she takes office. We will keep the pressure up."